I decided that one day in every week will be for kids. So today Maciek had to pick a subject of today's photo. I wasn't difficult guess what it will be. He choosed Lightning McQueen of course. Postanowiłam jedno zdjęcie w tygodniu oddać dzieciom, niech oni wybiorą, co ma doczekać się zdjęcia. Nie trudno było się domyślić, że na tapecie będą autka.. Maciek już mi zapowiedział, że dziś Zygzak a następnym razem Pan Król, Marucha, niebieski Zygzak i tak mam temat na czwartkowe zdjęcia już chyba do maja. Action by Pioneer Woman and overlay is by SBS. Dirty kids can be pretty too ;) We had pasta with spinach today and kids looked so funny with green faces so I couldn't resist taking this photo. Szymek, my 19 months old, wants to do everything by himself. Yesterday he was even more dirty than today. 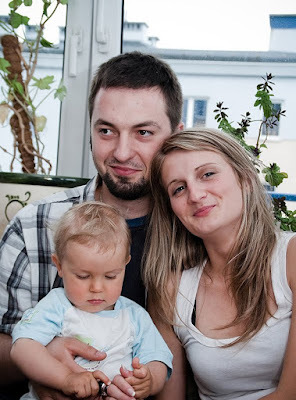 My family started reading my blog so from now I'll include polish text too. Szymciowi ostatnio włączyła się "samosia" - wszystko tylko "ja, ja, ja!!!". No i takie oto efekty. Choć starszy Maciuś wyglądał niewiele lepiej. Wczoraj Szymek był jeszcze bardziej brudny, na szczęście szpinak dobrze się pierze. 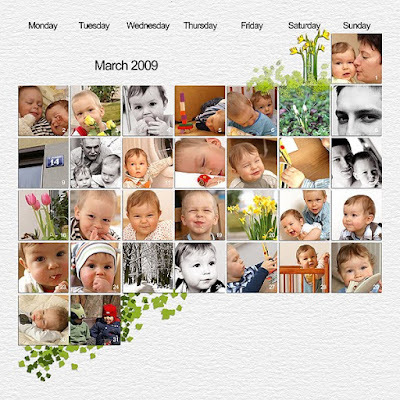 I discovered amazing site, I Heart Faces. You can find amazing photos there, great tutorials and challenges. This one was about textures. I tried using textures during P365 this year in few posts before so I decided to take part in this challenge. I also love the idea pf photographing faces, well, as I browsed my photo folder there are mostly my kids' faces. I had idea for this photo few days ago. My kids simply took a position like this and started kissing. I wish I could have camera with me then, they were so cute. Today I tried to make similar photo to the picture I had in my head. I played with textures by Something Blue Studios. Piotr forgot to close his notebook and Szymek immediately after getting up was just by a notebook. As I said, yesterday I tried to make some night shots of Warsaw. I planned it long time ago, I was with a friend, Magda (in digiworld she's known as mru). We planned this session a week ago but it's so hard to meet when you have kids and both of us have. So finally yesterday was a first day when we could meet and it was disaster. It was so freezing outside. 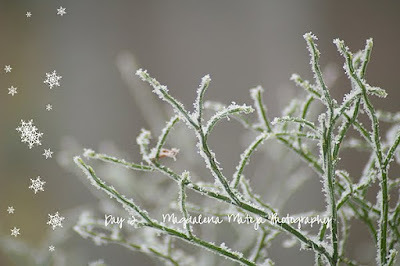 After few minutes my hands were frozen, my cheeks were frozen, I was like a piece of ice. It was 13 Celsius degrees below 0 and there was wind. I couldn't operate my camera in gloves and without it I could make one shot and I had to put them on because I coudn't move my fingers. So I have only few photos from yesterdays evening. We both were freezing so we had to drink something warm. 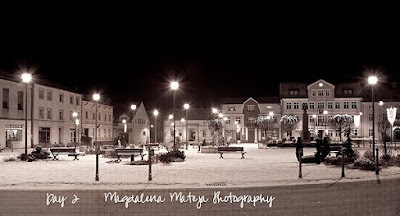 Todays photo is connected with Granfather's Day celebrated today in Poland. Maciek was preparing some gifts for both Grandmas and Grandpas, he made two cards for Piotr's parents and flowers for mine (he keeps saying "violet flower is for Grandma Renia and red tulip with glitteris for Grandpa Konrad"). Dziadek i babcia ciągle słyszą o prezentach, które na nich czekają w Warszawie ("zrobiłem Ci babciu pudełko, z takich małych ślimaczków, i kwiatuszka fioletowego, a dla Dziadka Konrada zrobiłem tulipana, czerwonego, z brokacikiem"). Pudełko (z warsztatów sprzed 2 tygodni) jeszcze leży w księgatni nieodebrane, no i wczoraj przyszły zamówione końcem grudnia fotoksiążki ze zdjęciami obu chłopców. Yesterday we had a very quiet day. In the morning kids were playing with cars. Well, they can't live without cars :) Maciek was playing his favourite part of this movie, when Lightning is pushing the King to finish the race. Today we were baking a bread (it's a greek bread with joghurt, looks yummy, I hope it'll taste great too). Kids enjoyed making and baking bread. Tomorrow I'm going to make some photos of Warsaw by night. I hopeI won't freeze there. Yesterday we wanted to make something different and we took kids to gardens. It was so pretty there, lots of flowers and fresh green leaves, I didn't want to leave. For kids biggest attraction were cats :) They were roaming with us and kids were crazy, they sat and watched cats and we could make some photos. On one there's my portrait, I don't like myself on photos, but my dear husband made me one so here it is. And lots of flowers in the middle of winter. Wycieczka do ogrodu botanicznego była naprawdę wspaniała, naprawdę można oczy nacieszyć. Choć zima piękna to we mnie rodzi się tęsknota do kwiatów, do zieleni, więc z tej okazji kilka zdjęć, dla podładowania akumulatorków w oczekiwaniu na wiosnę. Powsin jest całkiem niedaleko, więc jak tylko wiosna zawita będą wspaniałe różaneczniki i magnolie - w ubiegłym roku przegapiliśmy magnolie, ale w tym roku mam nadzieję trafimy tam na czas. I love orchids so much, I'm so glad Piotr took this photo. Colour of these orchids is amazing to me. Kasia proposed a little photo game for this week. We are supposed to make at least 3 b-w photo this week so this is my first. I like warm photos of Szymek so I edited it in LR2 to get warm photo of him. He was drinking his milk and he was making such a funny faces so I grabbed a camera and took him some photos. He was plaing with a milk, which he spilled on a table and he was sooo sweet so I coudn't resist to use this photo. 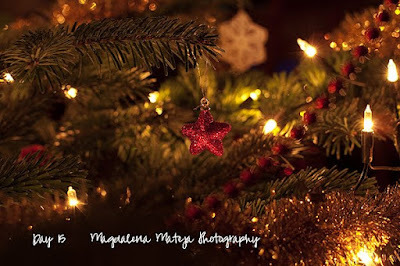 Today I'm with two photos - one is just saying good-bye to a Christmas tree we had during Christmas. 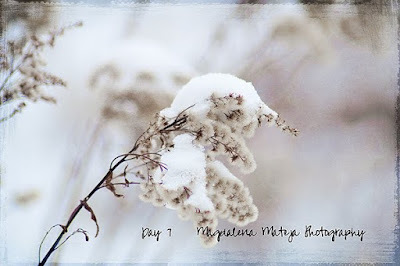 Today's photo was inspired by Kasia's snowman. 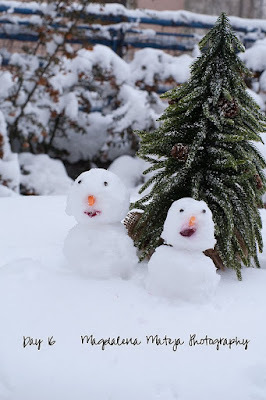 I thought her snowman was so cute that today I did two little snowmen for kids while we were outside. I also want to show you my three pages from my 2009 P365. I started it in March, stopped after holiday in September, but I had to make it to keep some of my memories. In my personal version there's journaling about important events that happened in these months, it's in polish so I didn't include it here. I'm back and I'm so glad!!! I have to say my hubby is brilliant, he reperated everything so quickly. Nothing was lost. One of our disks is on the way to service, the other works fine. Now I can show you photos from last days. On day 12 I just had to make a photo of a forest, which is near here. I want to dedicate this photo to Marta, who I was talking to about this place few days ago. 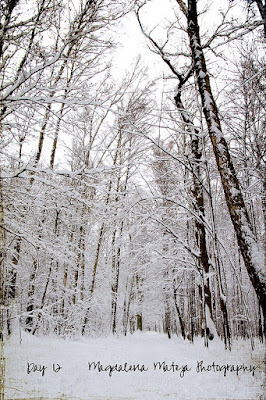 Kabacki Forest is so pretty now, under a soft eiderdown. Photo overlay by Vera Lim. Day 13 is dedicated to Kasia, who inspired me to take a photo of my warm socks. I love these socks, especially now, when it's so cold outside. Photo texture by Vera Lim. 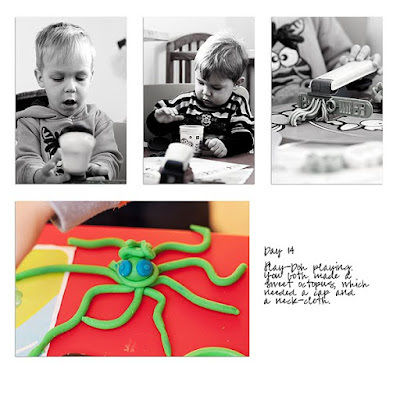 Today kids were playing Play-Doh and they loved it. Maciek made an octopus and then he said she needs a cap and neck-cloth because it's winter now. And he did both. I took one photo of this sweet octopus before Szymek took her eyes and tried to eat them. I'll start from the beginning. Few days ago I had some pc troubles, I got a message, that there's something wrong with HD. My DH (IT specialist) looked inside, checked and said it was fine. Today I got message, that one of HDs is damaged. I wasn't worried, because I have second copy of everything I did thatnks to RAID (I hope I write with sense, because I'm not IT specialist and I just can say what my brilliant DH says). After a walk with Szymek this morning I got message that everything is broken and I have to wait long hours for my DH and for diagnose of my pc. I'm terrified. What if both HDs are broken? What if I lost everything? I mean EVERYTHING!!!! Whole 3 years of Maciek's photos, all memories kept in scrapped pages, all recent photos. My DH is sure that one of disks is fine, but I'm terrified anyway. If it's something, I'll have my ps tomorrow (without backups in raid disks), if it's something else, I'll have my data on notebook tomorrow and pc after a week, if it's something else, I'll have my pc and data in a week. IN A WEEK!!!! What will I do!!!! I'm not even able edit photos in here, my lightroom presets are on pc, my yesterday's photos are there too. Keep your fingers for me, I hope I have my pc and data tomorrow. This evening I'll know diagnose. 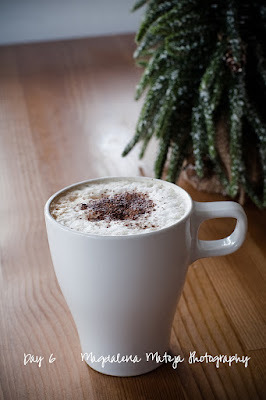 It was impossible to write and show photos everyday, especially on weekend. So today I have 3 sets of photos. On Sunday (Day 10) lots of things we did, we were on a small hill with kids and they were riding sledges. And in the evening we were participating crafting workshop for kids. 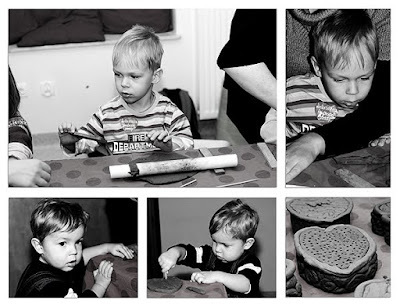 Kids were supposed to make clay boxes for grandma's (Grandma's day is on 21 January, Grandpa's day is on 22 January). 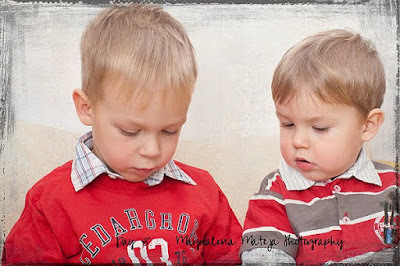 Well, Maciek started, but when he saw cars, he was gone and I had to make this box by myseld. Szymek was helping me, he was so focused on making holes in clay, he sat there for about an hour. 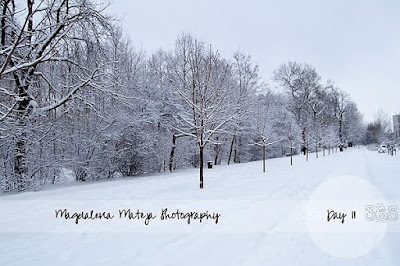 Today I wanted to show you Chestnut Avenue with snow. It looks so gorgous. 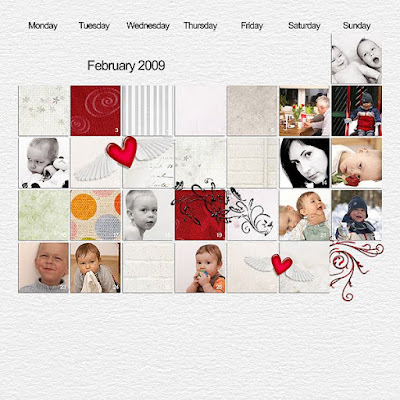 365 template by FruitLoOpSally. 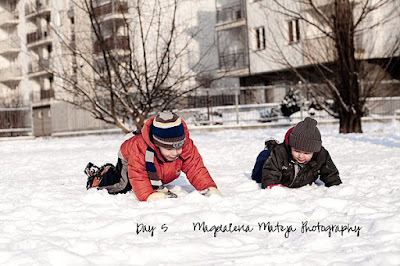 Now there will be some boring photos of my kids playing outside with snow. But now winter is so pretty here, snow is white and it's not melting so I want to capture as many photos with snow as I can. 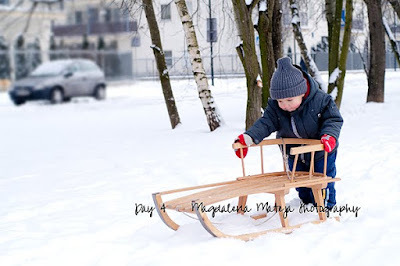 Maciek, my older son, was in the kindergarten and I was walking with Szymek and sleigh. 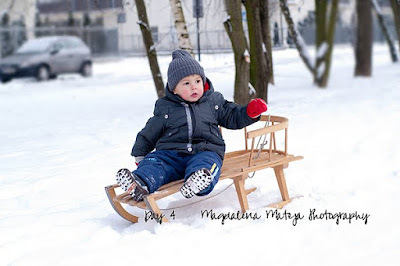 Believe me, it's so hard to keep him on sleigh, he wants to push it by himself and a second llater he wants to sit there, then he wants to get out and so on. He can't sit or stand still for 3 seconds. We spent that day at my parents and after dinner we went to Warszawa. Kids had fun eating snow while spending time outside. Then we came to our hometown (we both come from the same town), to parents, where kids were while we were in the mountains. 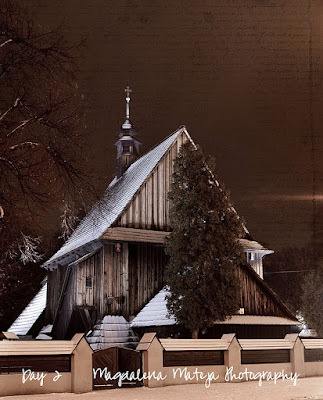 I had a chance to make few photos of Main Sqare and an old wooden church in Bierun. 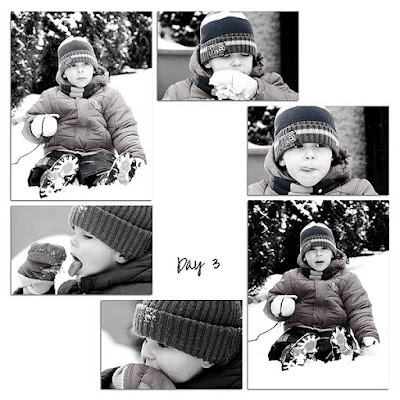 Photo textures by Vera Lim, snow by Kimla and Martencja.